Fix Symmetry is a LightWave 3D modeler script I wrote for my own personal use some time ago. I recently polished it a bit by giving it a decent GUI and some more options, so I could release it. I hope some of you might find the tool useful in your workflow. It’s a more elegant symmetry correction solution than my SymmXMirror tool as it’s non-destructive, but they both have their time and place when appropriate to use. Fix Symmetry offers three different functions to help taking care of symmetry problems in objects while modeling. 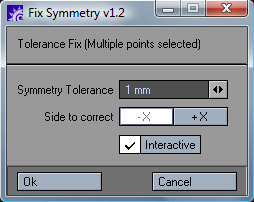 Symmetry Check, Quick Fix and the interactive Tolerance Fix. Check out my Fix Symmetry page for more details and to download the tool. YES! Another great way to non-destructively fix symmetry! I’m using both your symmetry plugins in my toolbox. Thanks for your contribution to the community saving us artists tons of time.